Looking for a unique gift for your little ones this holiday season? These 2017 Black Friday Coupons are amazing deals if you want to get your kids the gift that keeps on giving! You can try any of these subscription boxes for kids at a deeply discounted rate and cancel if you decide it's not for you. Kiwi Crate delivers 2-3 craft projects each month. Get 60% off your first month using this link. Check out our Kiwi Crate reviews! Green Kid Crafts delivers 3-4 eco-friendly, educational activity kits. Get 70% off your first month using coupon BLACK17 and this link! Get 40% off any single Discovery Box using coupon BFGET40. Check out our Green Kid Crafts reviews! 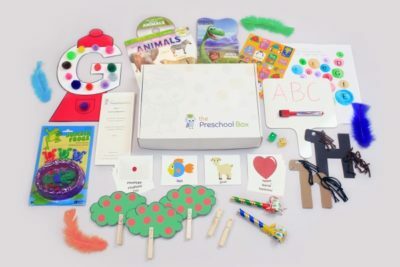 The Preschool Box is a fun, educational box for preschoolers and their parents ideal for ages 3-6. Get 10% off using coupon 10HOLIDAY and this link. Get 2-3 prepared seasonal kids crafts from We Craft Box! Take me to the We Craft Subscription Box! Learn about a new country each month with Sam and Sofia. Includes souvenirs, activity sheets, and stickers! Save 60% on the 1st month of any subscription using coupon SAVE60. Get $20 off 6 months with coupon BF20 and $40 off 12 months with coupon BF40. Get a box filled with art, craft and science hands-on projects for kids! Get 60% off your first month using coupon BLACK60 using this link. Receive a box filled with props for pretend play for open-ended play! Get 10% off site wide using this link. Kidstir sends you cooking tools and materials to make 3 kid-approved recipes! Get 75% off with coupon 75OFF using this link! Groovy Lab in a Box sends you everything you need to do hands on science, technology, engineering, and mathematics (STEM) experiments for ages 8+. Surprise Ride sends you a learning kit that includes all project supplies, a reading book, snack, fun extras, parent guide and easy-to-follow photo instructions. Monthly subscription boxes are gifts that keep on giving all year long! Disclosure: This list of monthly subscription boxes for kids contains affiliate and/or referral links, but all opinions are my own. This entry was posted in Subscription Boxes. Bookmark the permalink. Carefree Crafts enjoys searching for kids crafts that engage and develop young minds.